A Laboratory Information System (LIS) is the operation system of a medical laboratory. It manages all the processes within the lab including ordering, receiving, processing, and delivering results. It is also responsible for storing all information generated by the laboratory and making it accessible at all times. A good LIS software will boost productivity, improve turnaround time, and leverage the information that the lab receives for analysis and management. Choosing the right LIS is the difference between a lab that operates smoothly, productively, and with a happy workforce; and a lab that will constantly waste time and energy on processes unrelated to business as usual. Government regulations and incentives are pushing healthcare services to be more competitive, this is especially true in the LIS market where customers expect top quality and innovation from their LIS provider, as well as a broad scope of services and features. In recent years, all laboratories have been required to adapt their information management focus and use a LIS to automate the routine steps in their daily workflow. The transformation towards patient centered care means the flexibility with which these services are offered and the connection of a LIS to other devices is becoming increasingly important. Implementing a best-of-breed LIS system that supports complex workflows, while integrating with EMR/EHR systems, becomes the need of the hour. There is no shortage of factors to take into account when choosing a LIS, and every laboratory will have their own priorities in terms on what they need to focus on. A robust LIS will cover all a laboratory’s needs, and be flexible enough to seamlessly accommodate changes and future growth. Don’t compromise on the most important product in your lab! It is not only the features of a LIS that are important to a lab. Customer service is an inseparable part of a LIS software, and finding a vendor who will support you through your implementation journey to ensure business runs as usual is imperative. Finding a vendor with wide experience, a reputation for stability, a history of no downtime, and fast turnaround times is vital when choosing a LIS. Choosing the right LIS for your lab is game changing. No longer must lab workers drown in paperwork, do tasks manually that can be automated, and copy information between different systems. This guide will walk you through some key terms when choosing a LIS, and offers a checklist of factors to consider before making this all important purchase. 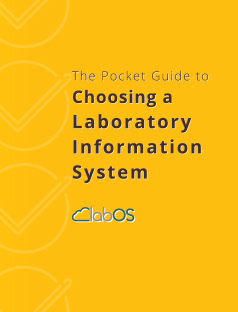 After reading this guide you should know more about what is important in order to lead the market in lab software, to introduce best practices in your lab, and to optimize healthcare and efficiency.